It’s fun to have guys participate in retreats sometimes. A few times of year we host co-ed, couple’s and family retreats and it’s awesome to switch up the energy with different types of participants. This week was a super fun mix of people all sharing their love for surfing and the ocean. We scored some fun waves at the long left point breaks right in front of our Longboard Surf House. After a few months off, Surf With Amigas returned to Nicaragua for a super fun retreat at our old home base. We scored great conditions and really fun waves for all levels. It was an incredibly frothy week with horseback galloping, dancing by local ladies, kickball with the local friends, and tons of good waves. We’ve got more Nicaragua retreats on our schedule for Fall 2019. Come play! “It’s not the destination its the journey”. You may have heard the saying “its not the destination its the journey”. It has always kind of annoyed me because the journey normally means long plane rides, delays, layovers, canceled flights etc., and I just want to get to the destination already and skip the “journey” part. But, it doesn’t have to be that way at all. It’s good to think of the journey as an adventure and wherever I end up, even if its not the place I had intended to go, as the destination. My latest surf adventure was by boat with 3 girlfriends, a cooler full of beer, a comically large quiver of surfboards, and a desire for right hand point breaks. We left not so bright but very early (4am) and loaded up the boat with all of our boards. We brought long boards, mid length boards and short boards. The great thing about traveling with a boat full of women is that we are always prepared with stylish surf costumes, which explains the plethora of bikinis, leggings, rash guards, surf hats, and some surf sun glasses. Oh, and just in case, the snorkel mask and fins. Surf With Amigas is mostly about all female adventures, but a few times per year we allow men to tag along. In this case we had a few couples and a mother/son duo who scored a really great swell. 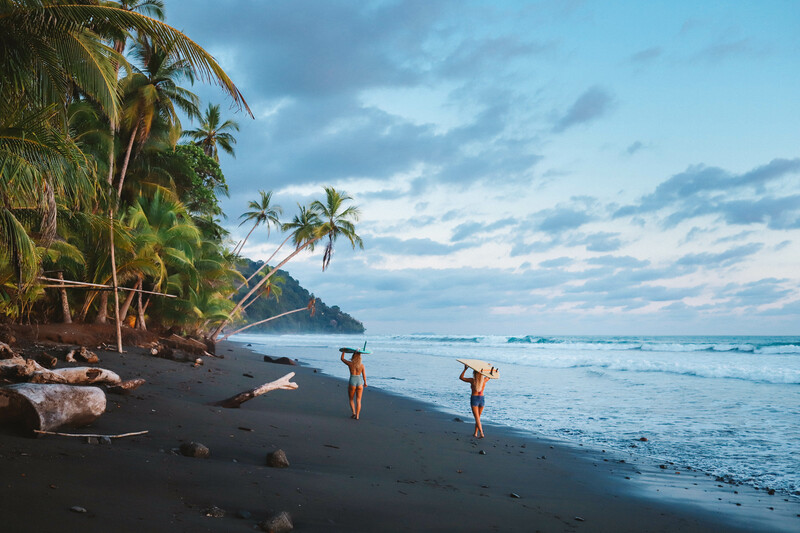 Check out all the action on a co-ed surf yoga adventure retreat in Costa Rica. Boat trips, smooth glassy waves, and a bunch of ladies excited to ride them, this was an awesome week! If you want to have an incredible adventure with other like minded Amigas, come join us on a retreat in Southern Costa Rica. Several times per year we host co-ed friendly/couple’s retreats. We love the all-women’s vibe but it’s also nice to mix it up and have some guy energy around. This particular week scored all time surf that was really uncrowded. Stoked! For those ladies who already know how to paddle into and ride down the line, we offer several advanced coaching sessions per year. On these retreats the focus is breaking down higher level skills via classroom sessions and awesome surf sessions with our super talented coaches. This particular week featured guest instructor – 2x world longboard champ Jen Smith and super stylish longboard cruiser Macy Sivage. Two time World Longboard Champ Jen Smith joined us on two retreats in early 2019 as a guest instructor. She inspired all the ladies with her super stylish nose riding and also technical surf knowledge. Here’s the highlight video from the week. 2XWorld Longboard Champ Jen Smith came down to Costa Rica to be head coach on a couple of advanced longboarding retreats. She leant her expertise and demonstrated immaculate style. Turns, glides, look backs and nose rides were going down every session. Here’s a quick little highlight from a morning session out front. In late November we scored a late season swell with perfect conditions during one of our co-ed Surf With Amigas Surf Yoga Adventure Retreats. The guests got some amazing waves and that highlight video is coming soon. In the meantime, here is a compilation of some of the waves that our staff scored that week in between coaching the guests. This week we also had Jackie’s fiance Hugh on the team. He was scoring super long nose rides. Jackie exhibited the utmost poise and grace. Michelle was demonstrating the shortboard shredding. Even Reesie, our yoga teacher rips, and with so much style!